Cozy and comfortable 2 bedroom/1 bathroom four season country cottage located on a quiet creek. 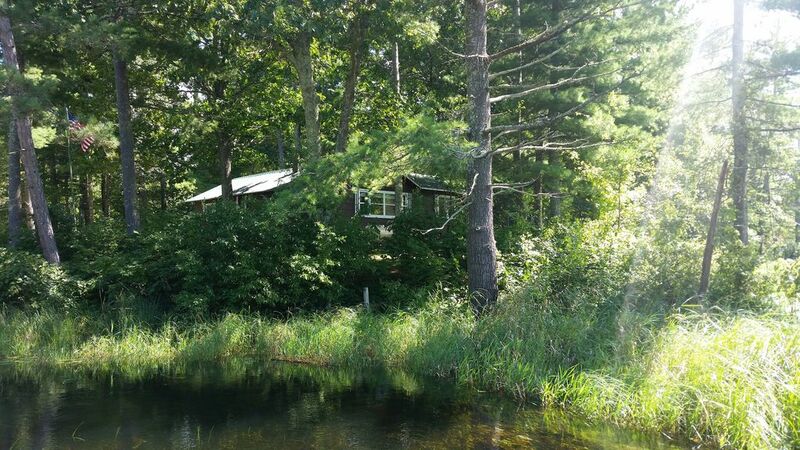 You'll love the location as it's located between downtown Hayward, WI and The Chequamegon-Nicolet National Forest. The area includes many lakes with great fishing, expansive public hunting land, and close to ATV, snowmobile, and cross country skiing trails. An ATV/snowmobile/boat rental shop, a horse riding stable, the 00 Trailhead, and more are within minutes away! Hello! My name is Wanda and I have enjoyed visiting and fishing the Hayward, WI and Lake Namakagon areas with my husband, who visited the area often, that we chose to retire in the area! I enjoy spending time with our small dogs while our 3 adult children are away throughout the country (Madison, WI and Florida). I want all our guests to have an excellent stay at our cottage and appreciate any feedback. I also enjoy meeting our guests as I only live a short distance away - feel free to say hello! All linens are provided for your stay! On-site parking large enough for a trailer, boat, etc. and multiple vehicles. All towels are provided for your stay! Living room includes a futon bed that can sleep 2 additional guests! Fully furnished kitchen with stove/oven/refrigerator/freezer. All utensils, glasses, plates, pots, pans, etc. included for your use! Lawn space on site that is great for a game of bags, Kubb, or other activities. A lovely little spot, easy to find, nice and cozy. Thank you so much for the lovely weekend away! We had a great stay at the cottage. It is very cozy, clean and spacious enough for a family of 5. Owner was very responsive and accommodating. The place was very clean, great views. The house was very spacious and well stocked. My family really enjoyed the stay for the weekend. We definitely will be back. Great place to stay, we enjoyed our stay! everything you want to see and do around this area i would highly recommend to all looking for a place to stay in this part of WI. THANK YOU! !